Misophonia, sometimes called selective sound sensitivity syndrome, is sensitivity to specific sounds. Some common triggers include eating sounds such as chewing, throat sounds, nasal sounds such as a person blowing their nose, and repetitive noises such as tapping or clicking a pen. While it is a potentially challenging symptom, misophonia is not a mental health diagnosis. A 2015 study of more than 300 people with misophonia found that only 2.2% had a mental health condition. Misophonia can be extremely distressing both to the person with misophobia and their loved ones. It can cause conflict in relationships and make it difficult for couples to go to certain public places. In addition, sensitivity to the sounds a romantic partner makes may be hurtful and feel overbearing or critical. People with misophonia may struggle to gain understanding and acceptance from their partner. A partner might dismiss the misophonia, arguing the person is being too sensitive or controlling. The person with misophonia may also be critical of their partner when they make noises perceived to be annoying. Parenting children together. Many children make loud, annoying, or repetitive noises. This can make it difficult to equitably distribute the parenting load and may also cause the person with misophonia to be angry or impatient with the child. Going out in public. Common misophonia triggers include the sounds of people eating, clicking sounds such as pens and clocks, sounds associated with driving and traffic, and other people’s body sounds. Eating together. Many people with misophonia are sensitive to sounds such as chewing and silverware scraping against a plate. Understanding and identifying misophonia. The partner of a person with misophonia may think their partner is exaggerating or being excessively critical. The person with misophonia may not understand that their sensitive reaction to sounds is not typical. A person with misophonia isn’t just annoyed by certain sounds; they find these sounds intolerable. Some even describe the sensation as physically painful, while others experience revulsion and disgust. In the context of a relationship, both partners may feel they have to plan their lives around misophonia. When a partner of a person with misophonia makes a triggering sound, they may feel judged, shamed, and criticized. People with misophonia may struggle to gain understanding and acceptance from their partner. A partner might dismiss the misophonia, arguing the person is being too sensitive or controlling. Talking openly with their partner about their misophonia. Seeking individual treatment for misophonia. Some research suggests that the way a person emotionally processes sounds can lead to misophonia, and therapy may help with this. Ruling out medical causes. Some studies suggest misophonia occurs in as many as 60% of people with tinnitus (persistent ringing in the ears). Autism, sensory processing disorder, and other diagnoses may also play a role in misophonia. Talking about how certain sounds make you feel rather than blaming or shaming your partner. Expressing disgust at the sound of chewing can be hurtful. Telling your partner that loud chewing makes you feel anxious or overwhelmed, even when you love the other person, is often more productive. Practicing strategies for managing your emotional reactions. Deep breathing, visualization, and positive affirmations, for example, may help with angry reactions to everyday sounds. Identifying your misophonia triggers. The more specific you can get, the better. One strategy for coping with misophonia is to slowly expose yourself to your triggers at low doses and in low-stress situations. This strategy works best with the help of a therapist or doctor. Try carrying earplugs when you go out in public. This may enable you and your partner to enjoy yourselves in public settings that might otherwise prove difficult or overwhelming. Taking misophonia seriously. If your partner says they cannot stand a sound, believe them and empathize with their emotions. Your partner may feel panic, rage, or pain in response to sounds that are neutral or only mildly annoying to you. Practicing self-care. If your partner is unable to go to certain places or do activities that you enjoy, do them on your own or recruit a friend. Separating your partner’s reaction to sounds from their feelings about you. It can be hurtful if your partner dislikes a sound you make, such as chewing or clicking a pen. This reaction is about the sound, not their feelings for you. Making reasonable accommodations for your partner’s needs. If you make a sound your partner cannot tolerate—such as chewing with your mouth open—it’s easy to feel defensive. But when this sound is something you can easily change, try to do so. People make many changes, small and large, in relationships. Reminding yourself of this fact can make it easier to change the sounds you make. Helping your partner identify misophonia triggers. Try to narrow to a list of specific triggers. For example, “traffic sounds” is vague and makes numerous public outings difficult. Disliking squealing tires is more specific. Specific information makes it easier to work around your partner’s sound sensitivities. Little research on misophonia supports specific treatments, and no drug has been approved for the treatment of misophonia. Preliminary evidence, however, suggests that cognitive behavioral therapy (CBT) may be effective. A 2017 study of 90 people with misophonia found that 48% had a significant reduction in symptoms of misophonia with CBT. Individual counseling may help a person with misophonia better understand their diagnosis and triggers, develop coping skills, and perhaps even overcome their triggers through progressive exposure. Help couples strategize ways to work around the misophonia. Support partners in better balancing family and household labor when misophonia makes certain tasks—such as caring for a crying baby—difficult. Empathize with one another’s emotions. 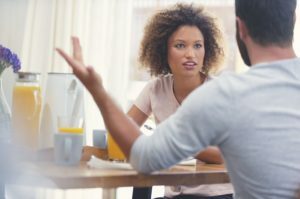 People with misophonia may feel dismissed and poorly understood by their partners, who may feel criticized or judged for their own sounds or resentful that misophonia limits the activities they can do together. Foster productive communication that avoids blame and shame. Teach couples skills to foster intimacy and closeness even when some outings and tasks are impossible. The right therapist helps both partners feel respected and safe. Therapists offer solutions without judgment in the privacy of a completely confidential session and can help you set goals that align with your values. Find a therapist near you who can help.